With the launch of the iPhone 6 and 6 Plus, Apple announced a partnership with U2 that saw the band's latest album distributed to iTunes users for free. In interviews following the launch of the album, U2's manager suggested Apple and U2 had formed a "long-term" relationship that would see them collaborating on additional projects, and now U2 frontman Bono has shed a bit more light on the partnership. 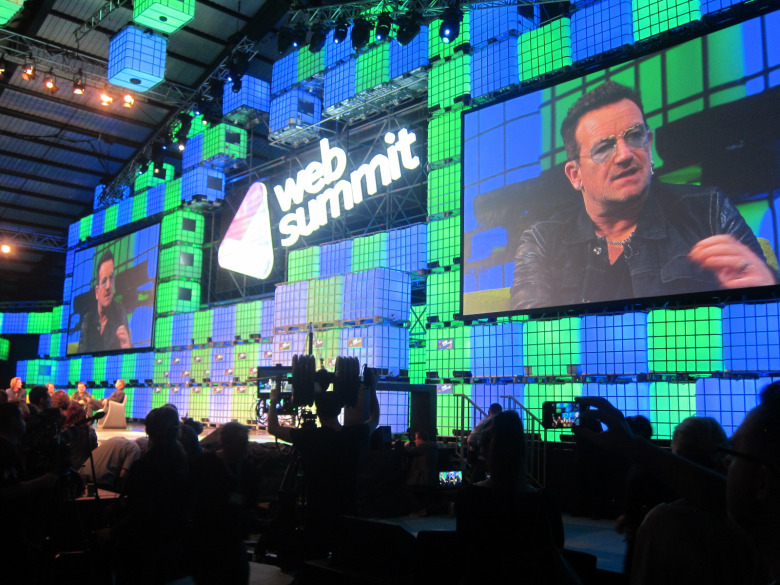 At the Web Summit in Dublin that VentureBeat attended, Bono told the audience that Apple "let us into the labs," suggesting the band's been able to work with Apple on unreleased products and services. Bono went on to share a story about an interaction with Steve Jobs that hints at what U2 and Apple might be doing. To illustrate the kind of concepts U2 and Apple might be exploring, Bono told the story of being in a house in France with Steve Jobs a decade ago. Bono looked at a version of iTunes being displayed on a TV screen and asked Jobs if he liked design so much, then "why does that look like a spreadsheet?" Bono said he had wondered why the album covers displayed on iTunes weren't interactive or why they didn't display archival photos, lyrics, or 3-D versions of band members: anything that would make for a more engaging visual experience with fans to complement the music. Jobs replied that the operating system and the technology didn't quite exist yet for such an experience. "But it does now," Bono said. Over the course of the last few years, Apple has been facing declining music downloads, which has led the company to launch iTunes Radio and purchase streaming music service Beats Music. There are rumors suggesting Apple is planning both a dramatic overhaul of iTunes and a rebranding of Beats Music, possibly merging the two into one all-inclusive service, and it's possible U2 is offering advice on new iTunes features. Apple has also been aiming to get artists more involved in the music distribution process. In a recent interview, Apple employees and Beats co-founders Dr. Dre and Jimmy Iovine said Apple's goal was to bring together the people who create art with those who distribute it, which has been evidenced in the company's recent endeavors with U2. In addition to his comments on what the band might be working on with Apple, Bono told the audience that U2 "wanted to work with the creative people at Apple, and that Jony Ive is a guy he'd "like to be in a band with. He'd be like a bigger Edge." He also commented on the negative reaction that the "Songs of Innocence" album garnered from some users, which he apologized for in October, saying "We got a lot of people who weren't interested in U2 to be mad at U2. I would call that an improvement in the relationship." Bono is completely full of himself if he thinks I want a 3D version of himself, or anyone else from U2. On a more serious note, this is dumb. I don't want a 3D version of anyone from any band, whether I like the band or not. If I like the band a lot I might want to go to the concert, but that's for the entire experience, not just so I can see the members of the band. Man... isn't there anything better to put on the MR Front Page... I though we established, and Bono acknowledged, we don't give a SHI#$^% what U2 has to say. Wouldn't it be cool if the artist could ditch labels and just release onto iTunes? Yes, screwing your loyal fans that pay $9.99 per month for access to your music via streaming services into paying an additional $9.99 to buy a CD at Target is "funny". How is that screwing loyal fans. For that single $9.99 payment, you get unlimited plays. That's a bargain. Streaming just is not worth the ongoing cost. "We got a lot of people who weren't interested in U2 to be mad at U2. I would call that an improvement in the relationship." Made me laugh. Here Bono, have a GoodBoy sticker for the day. Queue all the 14 year olds whining about U2s relevance. Settle down children, adults listen to music too. I'm sure Taylor Swift has something wonderful/relevant for you in the works. As far as I'm concerned, relevance has to do with your impact on the world, and you'd be hard pressed to find another band that does as much. U2s has raised more money to fight Aids then most of you will ever have in your life time. Meanwhile your "relevant" band is angsting about their daddy again, quick go ask your daddy if he'll buy it for you! hopefully Bono's secret sauce that has resulted in U2's latest turd albums didn't infect those in the lab. He had a perfect chance and blew it. He could have said "Make the bloody iTunes focus on Music. TV Shows and Movies can be handled separately." Sorry, Bono, but in order to manage 50,000 songs and 1,000 movies, a giant spreadsheet is EXACTLY what's needed. The only views that have any use to me in the most recent versions are the LIST views. All those other album art views are fluffy useless crap. I don't watch movies or listen to music very often in iTunes, that's what AppleTV and iPhone are for. But I DO use iTunes to curate all that media, and for that I need to be able to easily sort, scroll, and filter; and for that, you need a "spreadsheet." Clearly I am not a fan of the direction iTunes is taking.